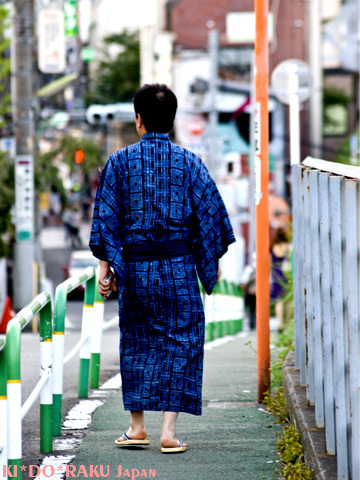 Knowledge : Men's Yukata - KIDORAKU Japan - What a Kimonoful World! Yukata is an unlined dyed cotton kimono for lounging or sleeping in summer. It's worn to enjoy a cool evening breeze or a summer festival in shrines. At first, it was used like a bathrobe in Edo period. and we wearing Yukata as a casual townwear for summer now. Now, in Japan, young women are considering Yukata like a summer dress. From about 5 years ago, a lot of companies started to sell Yukata. at volume sales supermarkets or shopping malls.